Galeria de Arte was in the building to the left as seen from the plaza. 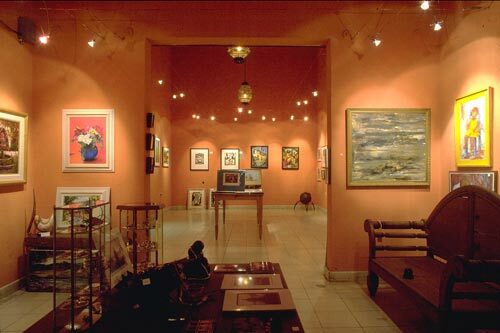 Beverly Krucek sent me several emails about the gallery she had on the Plaza Las Armas for many years. The following information is complied from her notes. The photo above was taken during the summer of 1996. Beverly was also a leading member of the Alamos Heritage-History Association, AHA, that meets at the Agave Cafe in the Hacienda de los Santos once a month in the summer and every Thursday morning during the rest of the year. 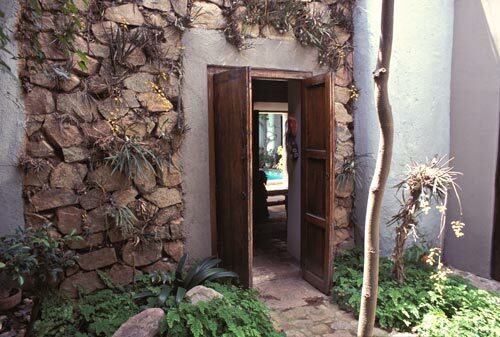 At times Alamos itself seems a living work of art and history and futures. 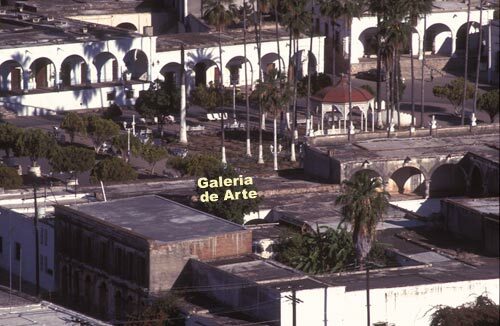 Beverly Krucek opened the Galeria de Arte on the Plaza in 1994. On average 25 artists were shown in three rooms, portal and patio. Artists came from all over Mexico, some from Columbia, as well as Tucson, Phoenix, New Mexico and a couple from France. Some 10 year later, Bev decided to trade up to a gallery in an art mall being developed and promoted by the Franks in the Urrea house on Calle Obregon. Unexpected problems arose that stopped the art mall project from going forward. By that time, Bev had turned her rental lease over to B.K. Hamma for her use as book shop, gift shop, and a new art galley leased to Vickie Lockwood. Upon taking a further look at the situation, it appeared to Bev that the tourist trade, which was her main target for sales, had fallen off so she left the gallery scene. Upon these walls, that have seen so much, art speaks of inside and outside. View from Mirador of building where Galeria de Arte was located. Years ago, when I was in Alamos, Hotel Alamos, also known by many of my friends as the old Miner’s Hotel, was in serious disrepair. Looking down from the church at Casa Nuzum, Calle Comercio 2. Calle Comercio 2 is across the street from the bank that was next to Galeria de Arte. 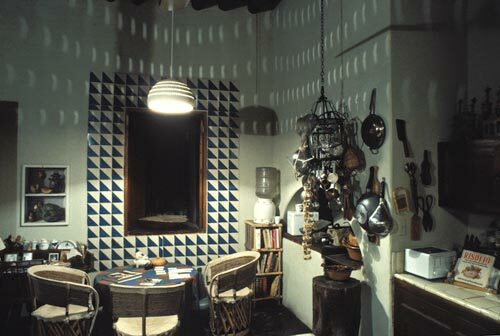 When I was a guest of Casa Nuzum there were paintings on the walls and art books in the library. 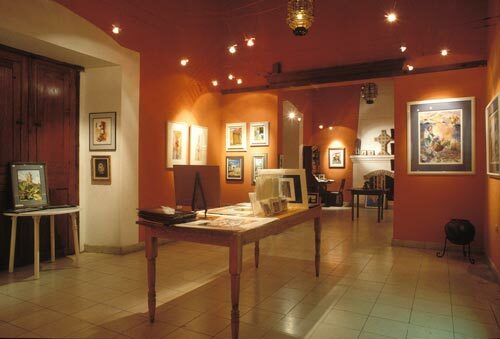 I always felt it would be a wonderful gallery space being next to the church and around the corner from the Plaza. Location, location, location… The concept of artists working and showing their work in this historic Casa is profound and hopefully productive. There is a recent history of artisans here, Elizabeth Nuzum hired local women to create her designer clothing line in a wonderful sewing studio in the back pool patio of the house. 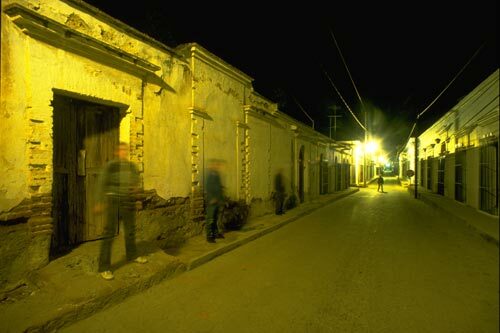 Our crew as ghosts on a quiet night in Centro Alamos. Calle Aurora connects the two busiest areas in Alamos: Alameda and Plaza de las Armas. It is an one-way street for cars and two-way passage for pedestrians, bicycles, and animals. 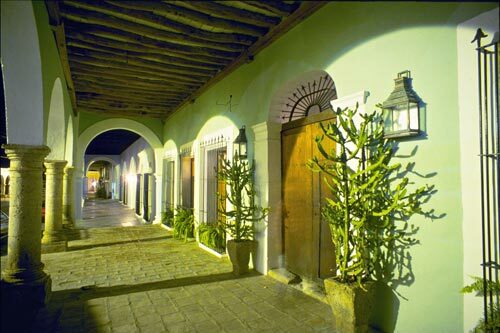 It is my favorite street in Alamos, long and narrow with a gentle climb to the Plaza. Most of the night it can be still, homes sleeping as peaceful ghosts come out to loiter and reminisce. This is our crew doubling for ghosts and providing scale and detail to a night portrait frozen in time. 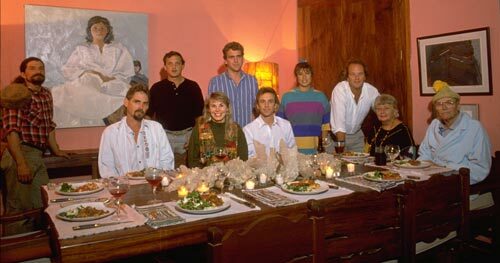 This is the crew that captured Alamos-Christmas-1993 and our hosts the Nuzums. Elizabeth and Pember. At this moment we were all together and thankful. 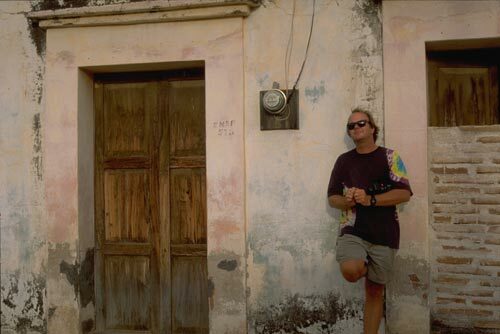 Gary Ruble photographs a passerby on Calle Hildalgo. Gary Ruble took slides, shot 16 mm film, primarily single-frame time lapse, and helped with audio recording. He also disappeared into the arms of Alamos. Often the question would be asked, ” where is Gary?” and the answers were ” we last saw him headed off with some folks”. This is a good example of a ruin’s interior. 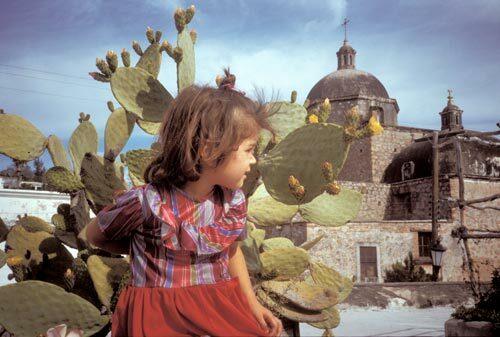 Since our 1993 shoot the population of Alamos has nearly doubled. Looking at Alamos from space with Google maps I can see new construction and new neighborhoods. Alamos has been part of the southwest’s now dormant building boom. Another factor for Alamos’s growth is the same as its beginnings – silver. A large silver mine to the north reopened in 1999. I wonder how many ruins are still available for purchase and renovation? 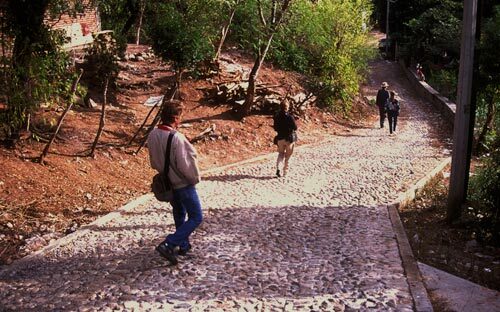 Part of the crew starts the day walking to town down Cerro Guadaloupe. The crew was staying in two places a ten minute walk apart separated by Cerro Guadaloupe. In Alamos, the greatest joys maybe the unanticipated twinklings en-route to a preconceived destination. For R.L. Harringto, Robert Ganey, Donna Beckett and Anders Tomlinson this was one of those moments as they came out of cool winter shade at Puerta Roja and walked into warm sun as they approached Alamos Centro. Kit Nuzum videos the crew creating an impromptu shadow dance. Within in every artist there is a child that will not be silenced. At times, the child will take control and a sense of humanity is produced. This is one of those moments: human shadows dancing across a wall of time. There was the wall, the sun was setting, why not dance holding hands? This recreated a moment from a 1983 Alamos film shot by Anders Tomlinson and Kit Nuzum of kids dancing by the camera, holding hands, with their shadows racing across the ground. Kit Nuzum, as the sun bids adieu, contemplates the meaning of meanings. Christopher, his friends know him as Kit, Nuzum first introduced me to Alamos. We met on a beach while filming and helping with a preproduction setup of a Suzanne Lacy public art performance, Whispers, The Waves, The Wind, featuring white covered tables with white chairs and women, all over the age of 65, dressed in white discussing their lives. The women’s reflections would be broadcasted over speakers up on the bluffs surrounding the cove. An interesting moment in time of age contemplating time. A couple of months later, spring of 1985, he invited me to go on a Mexico road trip. All he said about Alamos was that he knew I would like it. We arrived in Alamos hours before sunrise. 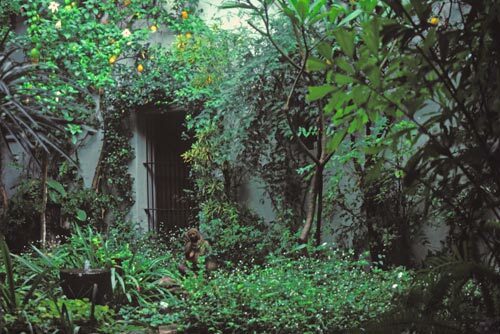 Driving up Calle Aurora into, and around the Plaza, to Calle Comercio #2 and entering the front courtyard of the Casa Nuzum was a step into a place I had never been before. Kit walked me through three garden areas, fountains gurgling under the stars, to a guest room waiting for me in the back. I went to sleep in a dream, I awake to Alamos. Today, 2013, Kit Nuzum is off the grid and brewing beer outside Puerto Varas, Chile. Here are 1993 Winter Alamos videos filmed by this crew. 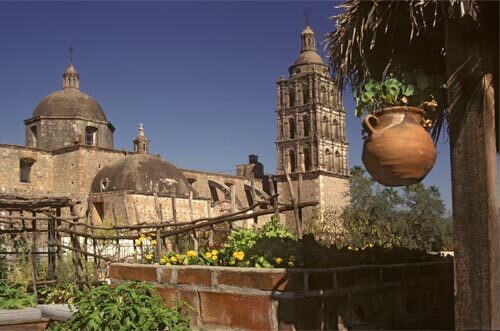 To see more Alamos, Sonora, Mexico videos by Anders and his associates. Casa Nuzum seen from Bishop Reyes Cathedral. These are two long-time neighbors. Pember and Elizabeth Nuzum first visit Alamos in 1953. They were introduced to Alamos by Tucson friends they were visiting in Guaymas. These friends told the Nuzums of a charming city down the two lane highway to Navajoa. The road from Navajoa to Alamos was dirt, full of ruts, crossed water and dirt and had roaming livestock, an ever-present danger. “The Tesoros was open then, and we would have liked to have stayed overnight–but our friends had to go back to Tucson, so we left. We came back again as soon as we could…” from an interview with Pember Nuzum by Bev Krucek and Leila Gillette. Elizabeth Nuzum remembered that the Tesoros wasn’t officially open at the time but the staff would make them sandwiches and they be warmed by fireplaces. Kit Nuzum recall that his parents traveled to Alamos in the 1960’s with Linda Ronstats’ family. 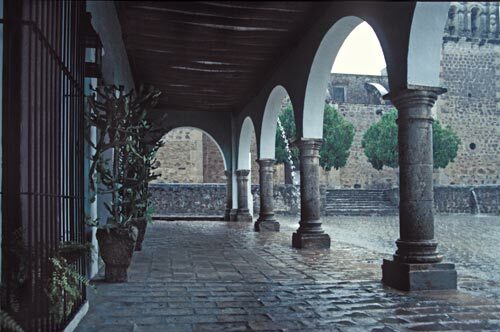 A refreshing summer rain cools and cleans the Alamos streets and air. A deal falls through and an opportunity rises. Over the next twenty-five years Pember and Elizabeth lived at their Williams Addition property, in what is now the center of Tucson, and visited Alamos often, staying at both the Tesoros and Portales Hotels. They were prepared to buy a house in Los Arcos, in Tucson, but the deal fell through and they bought a ruin on Calle Comercio 2 from Jack and Jane Stewart. Most likely famed resident and real estate entrepreneur Levant Alcorn was involved with the sale. Carlos Pratt notes that his father, Charles Holt Pratt Jr, Chuck to his friends, was the realtor and a close friend of Pember’s. The property had been vacant for fifty years with collapsed roofs, no plumbing or electricity, dirt floors and a .5″ water pipe in the back building. Pember recalled that an American had lived there and that his bathroom was a hole in the floor. The Cathedral, and its bells, are part of Casa Nuzum’s fabric and being. Home of the Silver Barons. 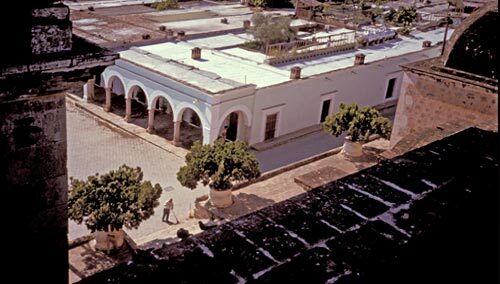 Calle Comercio was built in 1780 and was known as the Casa de “Chato Almada”, a famous Silver Baron, in the early 1800’s. 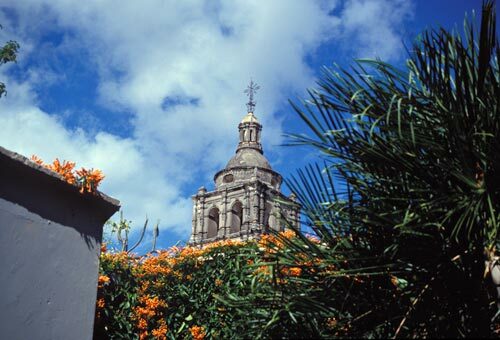 Official records indicate that work on the church, Bishop Reyes Cathedral, began in 1786 and was finished in 1803. One could have been inside this casa and watch the three – tiered belfry rise in the sky. Many have come to this door with a variety of reasons, expectations and wonder. A set of false teeth, a door and a fireplace. It took Pember And Elizabeth Nuzum four years to restore the project at a cost, according to Kit, their son, of $80,000. During the restoration they purchased an adjoining house from Micha, a nurse who lived in it. Pember remembered it was difficult to get her to vacant the property. Elizabeth recalled that part of the deal was providing Micha with a set of false teeth, a fireplace and a front door. Ana Marie Alcorn helped the Nuzums secure a deed, a difficult task, for the new addition. Now, the Nuzum project was a 8,000 square foot house sitting on 800 square meters. Relax. Listen to your heart. Breath deep. Appreciate. Be one with all. A body in the backyard. They moved from room to room as the restoration was underway. Don Jacinto Urbulan was the contractor. There was a drain in the front of the patio where the fountain is now. They moved it to the side. Pember states that they found a body in the backyard and bone bits scattered around the ruin. He theorized that the property may once had been part of the first churches’ courtyard. Does this fish understand how fortunate it has life in this well-tended pond? The prodigal son speaks of secret tunnels and silver ingots. the standard 18 inches. Mom would not let me dig in her walls. We found hollow spaces when putting in drains in the back utility room. This was suspected to be the famous escape route to the church. In the same walls, adjoining Edith Pratt’s place seven small skeletons were found. They were returned to a resting place. They might have been miscarriages or unwanted pregnancies. Just outside a world moves from here to there in both time and space. A popular color from the past. In painting the inside of their house, they tried to match the original colors. The coral color in their living room had been a popular color in the Álamos homes of the 19th Century. The scene above, minus the electric lights, could have been much the same two hundred years ago. The green house off the Plaza next to the Church. 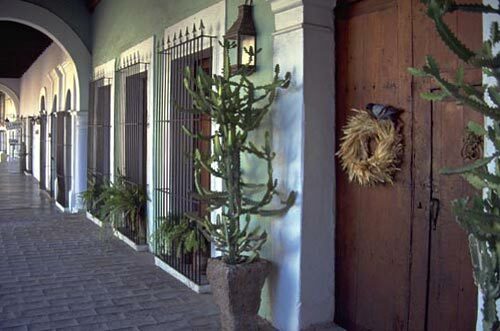 Casa Nuzum on Calle Comercio is known for the green color Pember and Elizabeth chose to paint the exterior. Most of the surrounding homes were painted white at that time. Elizabeth, in an interview, recalled that there may have been an ordinance requiring houses a certain distance from the church to be painted white or pastel. Such is life in a Colonial Center. Inside this door is the Nuzum family museum, beyond are bedrooms and workshops. Sharing is part of the Alamos spirit. 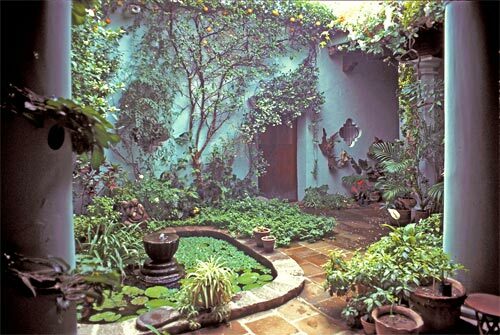 The Saturday Amigos de Educación house and garden tours of Calle Comercio 2 were usually led by Pember Nuzum. They would stop in a small room between patios and learn about the Nuzum family and, of course, the ghosts of Alamos. 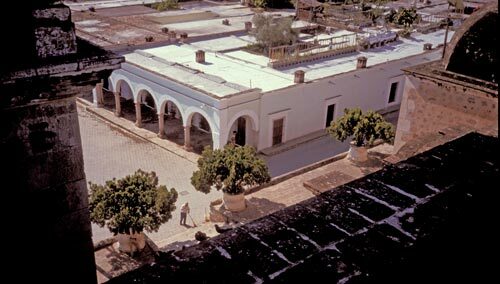 Elizabeth Nuzum had given Alamos a gift of a library which the city would take over. Tour money was donated to start a scholarship program which now supports many Alamos students. 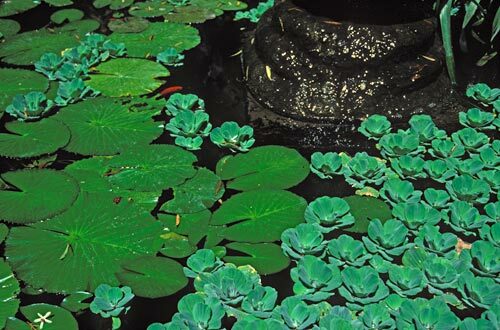 In the very back a small pool serves, reflects and comforts the soul. The back patio is where Elizabeth had a sewing room. Her close friendship with Pat Axelrod created a design business called Milagro. Carmen Rosas and her daughter sew the exquisite clothing, decorative pillows and pillows Elizabeth designed. The rear section of property has a secondary kitchen will all amenities, two bedrooms, two bathrooms, sala, laundry and pool. Spiral staircase to rooftop terrace with exceptional views. The rooftop garden was one of Elizabeth’s great joys. A busy kitchen is the heart of any and all Alamos’ casas. Enjoying modern comforts in a colonial setting. Calle Comercio 2’s main living section off of Calle Comercio has two courtyard gardens and portals for outdoor living. The formal salon is sixty feet in length with a grand fireplace and high ceilings. Full kitchen with traditional colonial oven, plus three bedrooms and two baths, library, dining, salon and office provide modern living comforts to a restoration true to its origins: spaces, ceilings, canterra columns, doors, windows, and other colonial architectural details. 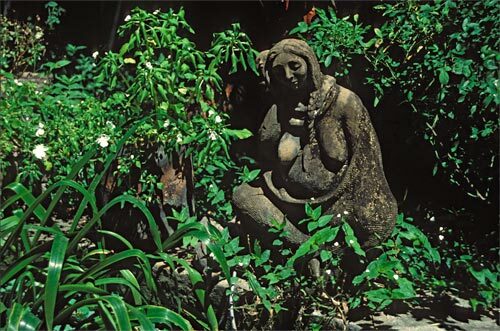 It takes attention and effort to keep these gardens flourishing. Reflecting on maintaining Calle Comercio 2. It takes a great effort to preserve a restoration. Kit writes, “Pember always had three full time employees: a mozo, gardener and maid. There was always a constant stream of mallestros from plumbing to carpentry to masons to laborers. The house was swept and dry mopped daily, 8000 square feet. The 3 patios were trimmed, watered and fertilized regularly. Another parade passes between Calle Comercio 2 and the Church. A place for encouragement and self-expression. A kite festival, started by Elizabeth and her daughter Cammie and son-in -law Chaco, has become a local tradition on windy March days. 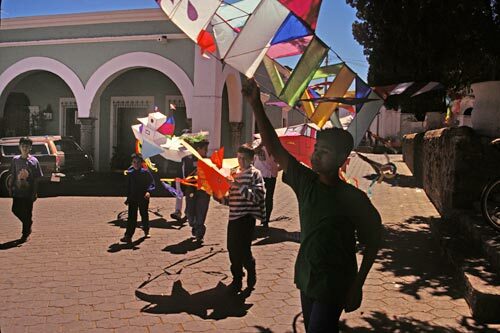 Seen above, young kite-flyers return from the Mirador at the top of Perico Hill. Calle Comercio is a parade throughout the day. Funerals pass by on their way from the Church to the graveyard. To and from school and market students and adults come and go. Elizabeth, and Calle Comercio, played an important part promoting education and the arts in Alamos, Sonora, Mexico. I often saw Elizabeth, “Bett” to her friends in this Madonna’s face. ©2014 Anders Tomlinson, Alamos History Association and Kit Nuzum, all rights reserved. 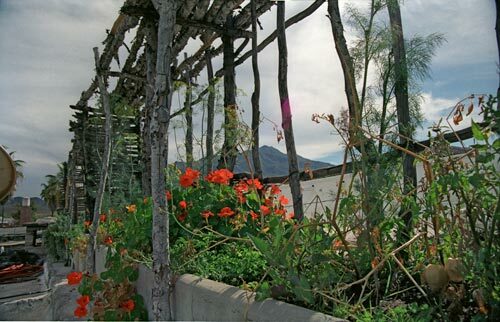 Elizabeth Nuzum's garden across the street from Bishop Reyes Cathedral. Here, in the shadow of cathedral bells and angelic choirs was a multi-purpose rooftop garden. 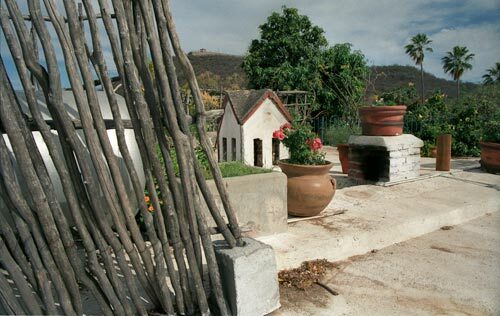 A narrow wrought iron caracol, snail, spiral staircase led one up from a back patio with a small pool to an expansive array of raised planter boxes. 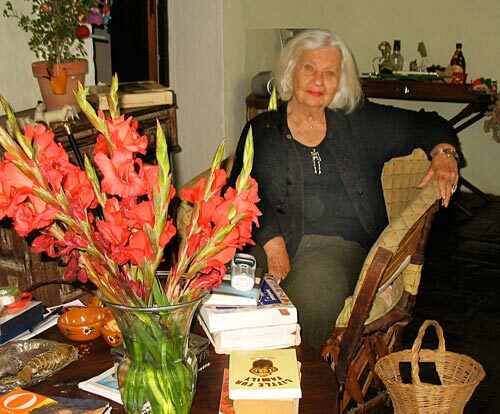 Elizabeth Nuzum enjoyed people, her home, her gardens and life in Alamos. For many, her husband Pember and Elizabeth were Alamos greeters, welcoming visitors inside the old wood doors on Calle Comercio. Elizabeth designed and managed her gardens while Pember kept an eye on the household finances. 20 feet above the street one can hold a conversation with passing clouds. The roof top garden and its 360 degree views was a special place. The sky at night, with stars there to be touched while one laid back on a substantial Sonoran cot, was a connection to all things in all places. Rooftop eavesdropping on the comings and goings along Calle Comercio and Calle Guadaloupe Victoria tuned one in with the heartbeats of Alamos: Bishop Reyes Cathedral, Palacio, Plaza de Las Armas, Mercado, all points of the compass and all events past and present. Mirador voices, at times, arrived here with a favorable wind. 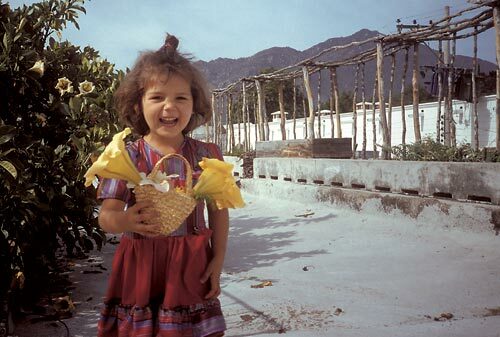 A young girl picks flowers on the roof, a simple moment, a simple smile. Christina Vega, daughter of Chacho and Cammie, sister of Gaspar, walked in all worlds Alamos. Her Mexican blood was Chaco’s large family and her American blood was Cammie’s parents Elizabeth and Pember and brother Kit who came to visit from his world travels. 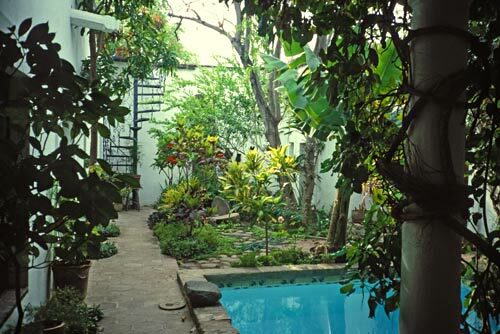 Cammie and Chacho lived modestly on Calle Ninos Heroes, a short walk from the grand roof top garden on the the other side of Guadaloupe Hill. What does Christina see, and hear, on this spring day in 1984? The roof’s northwest corner, with a view into the Plaza and Gazebo, was across the street from the bank. At opening time a line of people would be waiting sharing conversation. Daily masses brought people to the church’s eastern door. Funerals processions would leave the church and passed by as they headed east to the Panteon – Cemetery. Police headquarters, at times busy, were three houses to the east on Calle Comercio. Tourists speaking English, French, German and other languages would stop and chat as they headed to and from surrounding lodging. At night, one could listen to quitar playing coming from Polos restaurant’s kitchen as well as the Estudiantina practicing at the Museum. At this moment Christina is listening to the public serenade that is Alamos. 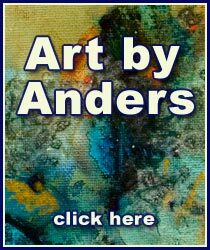 Pember told Anders, “always call us Alamos, Sonora, Mexico.” And Anders has. Pember and Elizabeth Nuzum were a major part of the North American Community for decades. 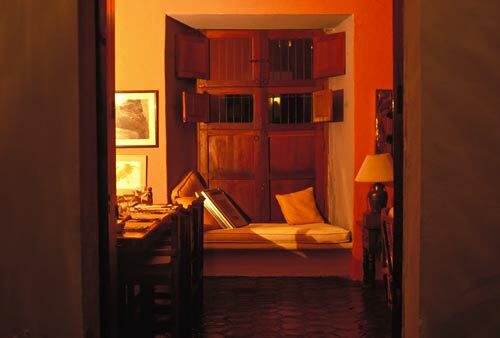 Their casa next to the Church on Calle Comercio #2 greeted many many who visited Alamos, including Anders. It is not uncommon to have rain squalls in December. And it was common to hear Pember playing his theater organ in the Nuzum music room. Those days are gone. But the spirit lingers, it always does. This page took 0.386 seconds of computer labor to produce.